The best way to protect you property is to gather plenty of information for advanced planning. If you are Building in a Flood Hazard Area, the surest way to protect property and minimize damage to your building is to build your structure above the elevation of the 100-year flood and strictly follow local ordinances regarding building in the floodplain. To determine your flood risk, visit the FloodSmart, the official website of the National Flood Insurance Program. Older properties that are already situated in a special flood hazard area (SFHA) require more consideration for flood protection. One way to minimize damage is to eliminate any enclosed habitable spaces at ground level, remove any non-water resistant materials below base flood elevation, move any mechanical and electrical equipment below base flood elevation (BFE) to a higher location in the building and structurally reinforce the foundation. Homeowners' insurance does not cover damages caused by flooding. The Town of Vinton recommends that people who live near or in a floodplain purchase flood insurance, even if it is not mandated by your mortgage company. Every year, 25% of flood damages occur on properties outside of the floodplain. 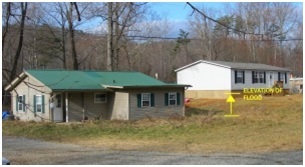 Flood insurance is available to everyone in the Town of Vinton, even if you do not live in a floodplain. To learn more about flood insurance, visit the FloodSmart, the official website of the National Flood Insurance Program. To learn more about how to protect your home from flood damage, visit the Federal Emergency Management Agency's website.